New Idea for a Contest - Dungeon Crawl! Hey everybody, I was recently had an idea for a contest-what if players built their deck similar to Planeswalker's Journey by @Jonteman93 and the other contest made by @TenebrisNemo and fought against bosses (controlled by yours truly) in order to progress? A challenge would be made once a week that allowed players to add more slots to their deck, and give them the opportunity to gain points. Players who were in the lead are given a chance to fight against bosses that become increasingly powerful and achieve amazing treasures to add to their deck. Fear not though, for people who are behind, for their are ways to gain additional points through special one use powerups. The additional points wouldn't be enough to move someone from zero to hero in one fell swoop, though, so it would still be wise to make polished cards. I will try to fully flesh out the idea by Thanksgiving, and have it ready in the early winter (maybe even on my birthday!). Since this is my first contest, would anyone be willing to share any suggestions? Untap.in would be used to emulate the boss battles. For those who don't have Google Chrome, you won't be able to participate in Boss Battles. I think we should do this but we should be divided into adventuring parties to give it a real D&D dungeon crawl theme. This way we can force contestants to cooperate and we can do more than bosses if that gets too dull. @BorosPaladin and it would allow me to schedule not as many fights. I love this idea. Thank you for bringing it up! Maybe the final battle is that the winning party plays a game of Free for All to see who keeps all the glory (like classic D&D). This could be a way to allow players to test out their final decks on each other; the bosses aren’t meant to be played as normal players. In addition to this, I believe there should be a bonus card of the week (COTW) that provides the team that gets it with an additional 20 points in order to promote well made cards instead of mass produced cards. However, I am unsure whether or not this is a good idea. Do you guys think this bonus should be implemented, or would it cause giant leaps between the leading team and those behind. @MonkeyPirate2002 COTW sounds good, just make sure you're giving it to the actual best card of the week instead of the person that's most ahead. @ShaperKyon I agree with what you are saying. The best card is most likely made by the person in the lead, which causes the divide between the leading party and everyone else to get bigger. This is what I want to avoid. @MonkeyPirate2002 Well, in Planeswalker's Journey the person in the lead was often the person with the most cards, not necessarily the person with the best cards. @ShaperKyon Yeah, it was frustrating to see that I got eliminated early simply because I didn't use all of my cards. It's not fun to deal with that crap. I want to focus more on the quality of cards in this contest. I'm actually going to give LESS card slots to players just to encourage them into making better cards. This does mean I will be getting rid of the rule that says you die when you draw from an empty deck, just to make it more fair to the players. I was wondering, should the fatigue system from Hearthstone be implemented into the battles? That would make it more forgiving to have a small amount of cards in your deck and still allow mill decks to be viable (granted the opponents would have to draw cards in order to make this work). One thing I was thinking someone should do in one of these competitive tournament contest is create a point based reward system. Here's what I mean. Rewards should be given as points instead of cards, this allows players to customize what they want do do with there wins and not be forced down a narrow path. It also balances out people who only make expensive cards as they will have less points in the tournament with people who make more cheap cards as they will do terribly in a boss fight with a deck of 140 commons. You could also separate them into creature points, or white points to limit what people can do as needed. This is an experimental idea and I would appreciate feedback. Also your common about cards being judged on quality instead of quantity goes without saying. I just believe that there are better ways to encourage quality that limiting people card slots. Because honestly I prefer making more cards than fewer when given the choice. @BorosPaladin I like the idea of having the rewards of challenges being points that you spend in order to gain cards. I checked out @Arceus8523 's idea of how you gain points in Planeswalker's Journey and he said that people should be given an amount of "resource points" proportional to the number of "scoring points" that person won. Also, I think it would be interesting to have items that are on the "card shop" that give bonus effects for those who are willing to fork over a LOT of their resource points (and maybe even scoring points!). The items wouldn't last on the shop for long though, as they would be replaced by other items at the start of the next challenge. I like this card shop It shows potential you might even be able to sell cards to the shop although that would require serious consideration. Or you could make it between players with the whole everything goes you see in monopoly. In other words if you pay me 100 victory points for a common as long as we both agree it works. @BorosPaladin I think the only things that should be allowed to be sold are treasures acquired from bosses. Trading would also likely be only allowed between party members, although I may change my mind later on. That both works and makes sense. I like it. I think you should also consider implementing an arsenal like I suggested in Planeswalkers Journey. This way we could prepare full decks to fight bosses, while still limiting the amount of cards we can use for challenges which makes your life easier. @BorosPaladin Can you clarify on what you mean by "arsenal"? Basically for elimination challenges instead of judging all the cards in our spell book you give us a number of cards to put in our arsenal and only judge those cards, this way our spell books can still have overspecialized cards from challenges while still being able to perform well in challenges, (we don't have dead useless cards). This way you also don't have to judge our entire spell book you just have to judge the cards we put in our arsenal. This means you don't have to spend hours counting points you just hand victory points as a reward for challenges instead of based on the value of a card. This way we can focus on challenges without making duds. When are people allowed legendaries? @Axnoodle I'm gonna make legendary slots follow the same rules as the rest of the slots. All its going to do in my challeng is slightly reduce the power level of cards. Also, I'm going to make the maximum amount of points you can achieve with a single card be the same regardless of rarity. The reason why you would want to get mythics over commons despite being more expensive is that the mythic rarity would reduce your power level a LOT. @DoctorFro I totally understand the situation, I’m a student myself! I’ll try to make a flexible schedule. On a side note, I was able to make this contest an Independent Study for me during my parent-teacher conference. WOOP WOOP!! Decided to make a low-mid level boss to show how they would look like. 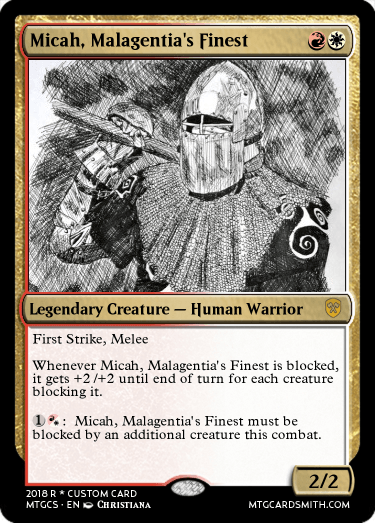 "Micah, also known as 'the Giggling Beast of Malagentia,' is the greatest fighter to have ever ventured into the dungeon. At least from his town." This is strikingly resemblant of Hearthstone’s Dungeon Run. Should I remake some of those treasures to use in this game? @OmnipresentAnonymous If you got any ideas, you can post 'em here. Just keep in mind I may not use all of the treasures you post. Yes, this is very much based of of Kolbolds and Catacombs' Dungeon Run. However, I am gonna try and flesh it out so that it runs more like a D&D campaign with a story (albeit a simple one). I will get to work tomorrow. Since I was planning on making the contest like D&D, how do you think I should emulate the die rolls? Also @OmnipresentAnonymous it's been more than a day. YOU LIED TO ME!!!!!!!!!!!!!!!!!!!!!!!!!!!!!!!!!!!!!!!!!!!!!!!!!!!!!!!!!!!!!!!!!!!!!!!!!!!!!!!!!!!!!!!!!!!!!!!!!!!!!!!!!!!!!!!!!!!!!!!!!!!!!!!!!!!!!!!!!!!!!!!!!!!!!!!!!!!!!!!!!!!!!!!!!!!!!!!!!!!!!!!!!!!!!!!!!!!!!!!!!!!!!!!!!!!!!!!!!!!!!!!!!!!!!!!!!!!!!!!!!!!!!!!!!!!!!!!!!!!!!!!!!!!! Sorry. I have been preoccupied with things.